Since the 1950s, the popular calculation of how old a dog was “in human years” has been that 1 dog year is the equivalent of 7 human ones. Even though this formula has been around for a surprisingly long time, the reality is not so cut-and-dried. That doesn’t stop many people from defaulting to this traditional calculation. “You can’t really kill the seven-year rule,” says Kelly M. Cassidy, a curator of the Charles R. Connor Museum at Washington State University, who compiles studies about longevity in dogs. One explanation for how this formula got started is that the 7:1 ratio seems to have been based on the statistic that people lived to about 70, and dogs to about 10. 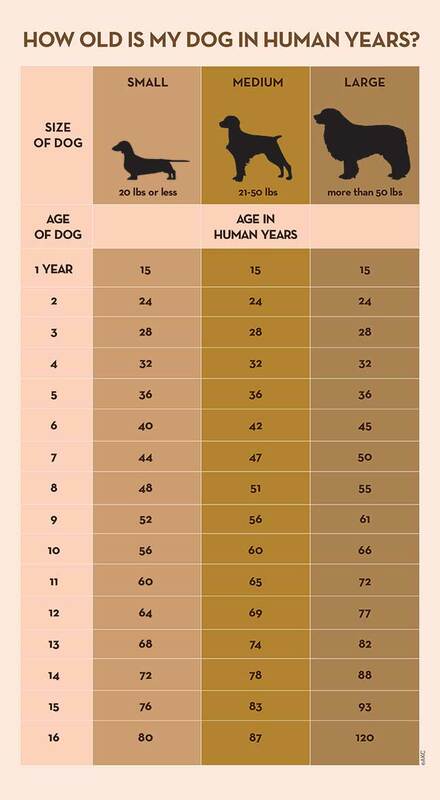 How to Calculate Dog Years to Human Years? 15 human years equals the first year of a medium-sized dog’s life. Year two for a dog equals about nine years for a human. And after that, each human year would be approximately five years for a dog. How Do Researchers Come Up With Those Numbers? An example would be the Great Dane. The average life expectancy, according to the Great Dane Club of America, is about 7–10 years. Therefore, a 4-year-old Great Dane would already be 35 in human years. Again, keep in mind that these are rough estimates. The National Center for Health Statistics doesn’t keep records for dogs. Instead, there are three main sources for data on their longevity: pet-insurance companies, breed-club surveys, and veterinary hospitals. This phenomenon has baffled scientists for years, and research has yet to explain the relationship between body mass and a dog’s lifespan. Generally speaking, large mammals, like elephants and whales, tend to live longer than small ones, like mice. So why do small dogs have a longer average life span than large breeds? Large dogs age at an accelerated pace, and “their lives seem to unwind in fast motion,” according to researcher Cornelia Kraus, an evolutionary biologist at the University of Göttingen in Germany, speaking to Inside Science. Scientists concluded that every 4.4 pounds of body mass reduced a dog’s life expectancy by about a month. The reason why is still unknown, though Kraus puts forward several possibilities, including that larger dogs may succumb to age-related illnesses sooner and that the accelerated growth of large dogs may lead to a higher likelihood of abnormal cell growth and death from cancer. Scientists plan future studies to better explain the link between growth and mortality. Whether measured in human years or dog years, as our dogs mature and age there is beauty and charm at every step along the way. With their gray muzzles and wise expressions, senior dogs are especially lovable and poignant. Evidently people have been comparing human- to dog years for centuries. By this math, a dog lives to nine, a man to 80. If these statistics were accurate, between 1268 and the mid-20th century, dogs had a year trimmed off their lifespan, and we lost almost a decade. Luckily for both species, our lifespans have gone in the other direction. Find out how to be the best dog owner throughout your dog’s life in the video below.